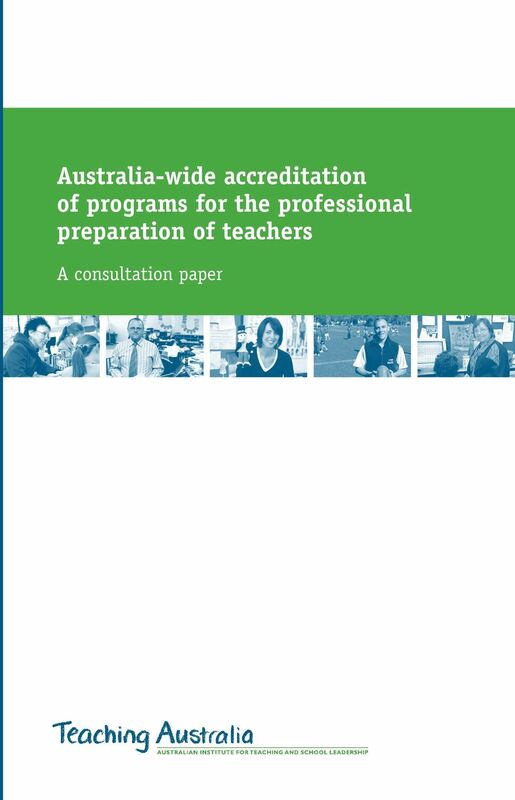 Download "Australia-wide accreditation of programs for the professional preparation of teachers. A consultation paper"
6 Strengthening the profession through partnerships 17. While there are many factors that influence the quality of teaching, initial professional preparation is the foundation on which the profession is built. Accreditation is an important mechanism for engaging members of the profession in decisions about the standards expected of those entering their profession, as well as standards expected of preparation courses. 18. A profession-wide accreditation system will provide a sound basis for strengthening and sustaining partnerships between universities, employers and the profession. Positioning Australian teachers in a global education market 19. It is important that Australian universities offer professional preparation courses leading to nationally and internationally recognised qualifications. Teachers themselves benefit from professional mobility. An Australia-wide approach will enable graduate qualifications to be recognised throughout Australia and be marketed internationally. It will create a basis for the establishment of international mutual recognition arrangements. Reducing duplication 20. 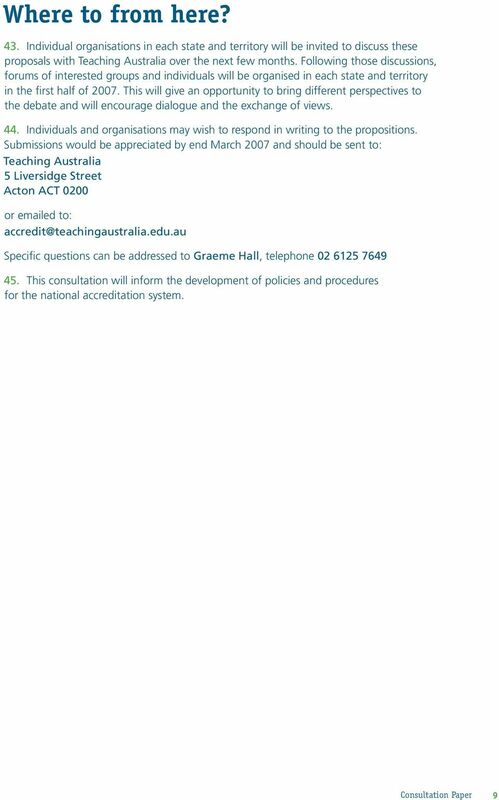 An Australia-wide accreditation system will reduce duplication of effort. Those universities that cross state boundaries need to seek course approval in several states. Most universities need graduates from their programs to be eligible for registration in more than one jurisdiction and overseas, without having to undergo multiple accreditation processes. 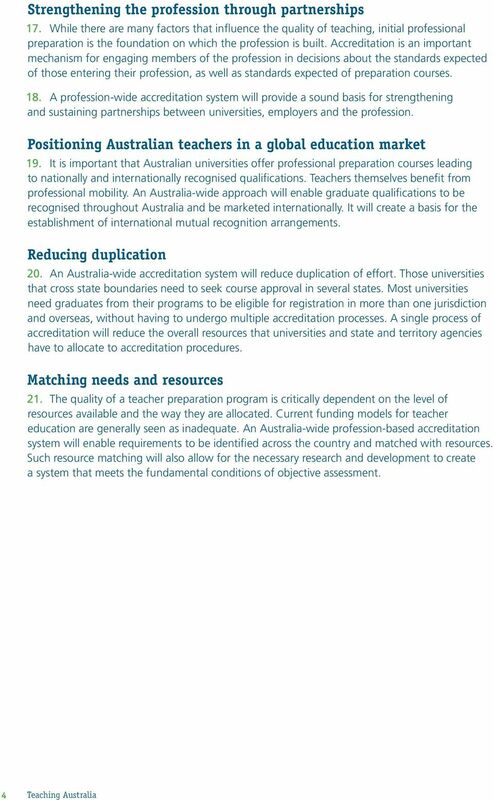 A single process of accreditation will reduce the overall resources that universities and state and territory agencies have to allocate to accreditation procedures. Matching needs and resources 21. The quality of a teacher preparation program is critically dependent on the level of resources available and the way they are allocated. Current funding models for teacher education are generally seen as inadequate. 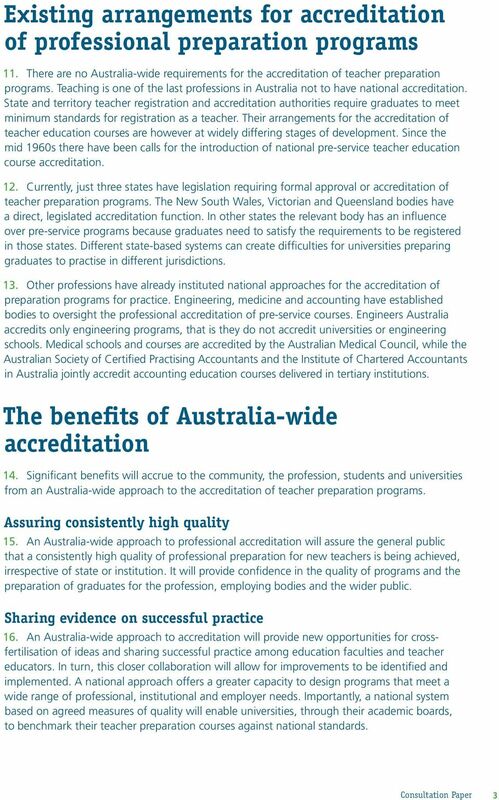 An Australia-wide profession-based accreditation system will enable requirements to be identified across the country and matched with resources. 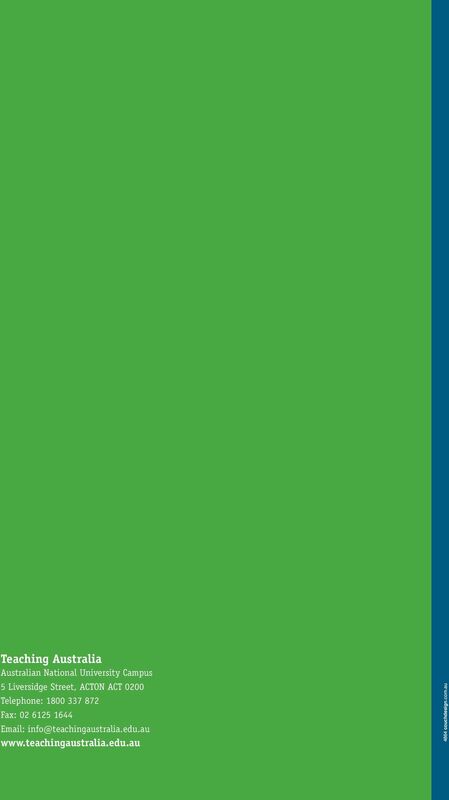 Such resource matching will also allow for the necessary research and development to create a system that meets the fundamental conditions of objective assessment. 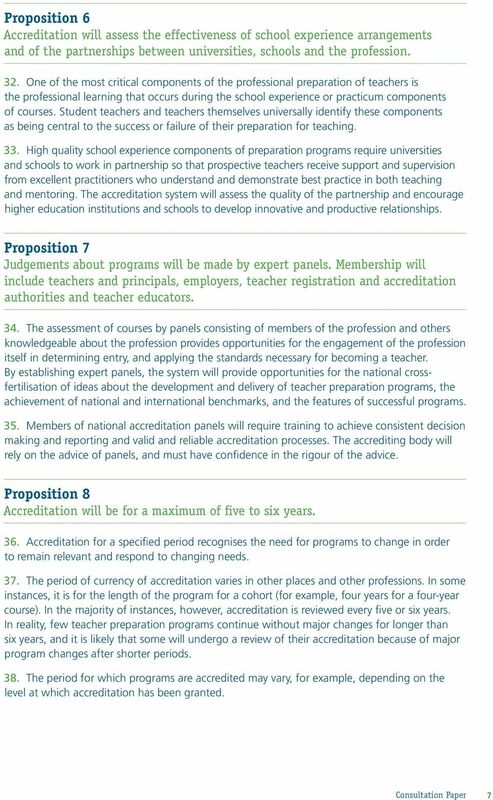 8 Proposition 3 Accreditation standards will build on existing acceptable practices and frameworks, in collaboration with state and territory teacher registration and accreditation authorities. 27. Most of the state and territory teacher registration and accreditation bodies have legislated responsibilities for the approval of teacher education programs, related to assessing suitability of graduates for registration in that state or territory. 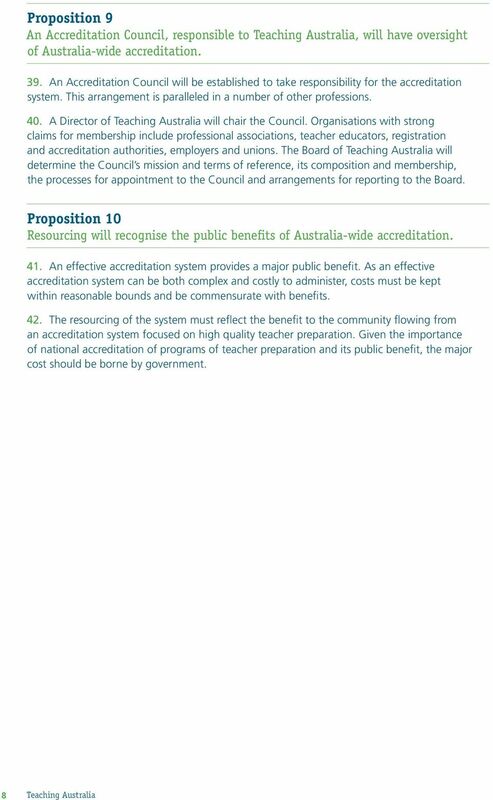 28. will work closely with regulatory authorities in developing an Australiawide accreditation system. 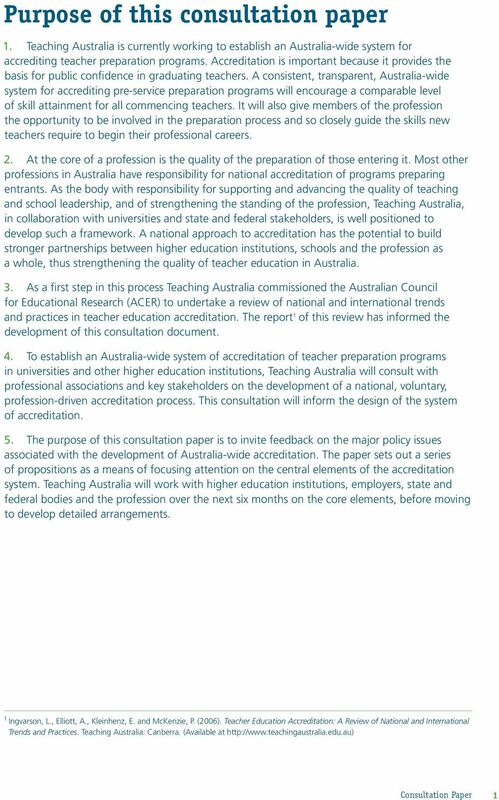 It will take as its starting point the National Framework for Professional Standards for Teaching as agreed by Commonwealth and State Ministers and accreditation processes already in place or being developed. 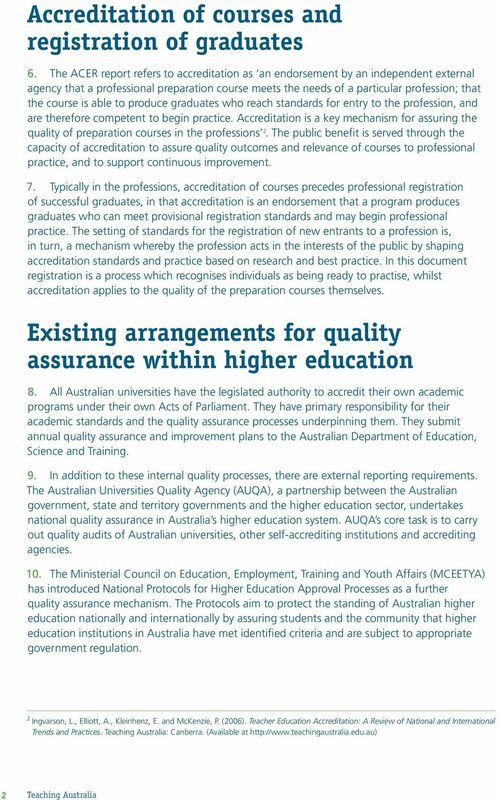 Building on these processes will allow national accreditation standards to draw on both graduate standards and accreditation arrangements already in place or being developed. 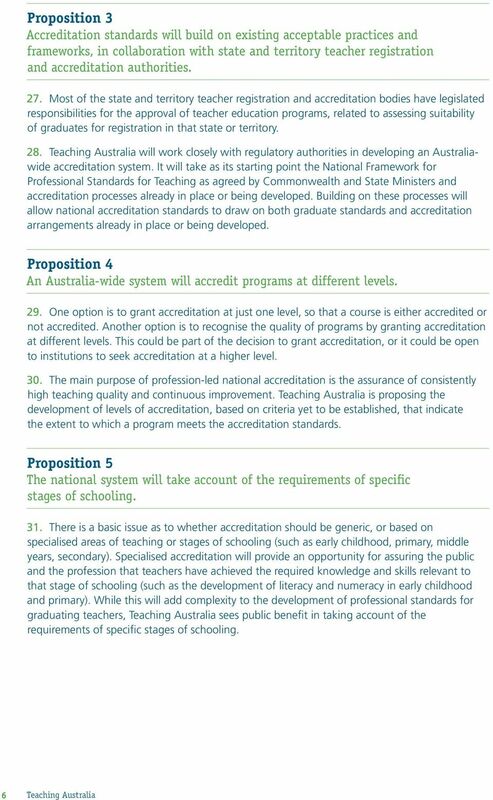 Proposition 4 An Australia-wide system will accredit programs at different levels. 29. One option is to grant accreditation at just one level, so that a course is either accredited or not accredited. Another option is to recognise the quality of programs by granting accreditation at different levels. This could be part of the decision to grant accreditation, or it could be open to institutions to seek accreditation at a higher level. 30. The main purpose of profession-led national accreditation is the assurance of consistently high teaching quality and continuous improvement. 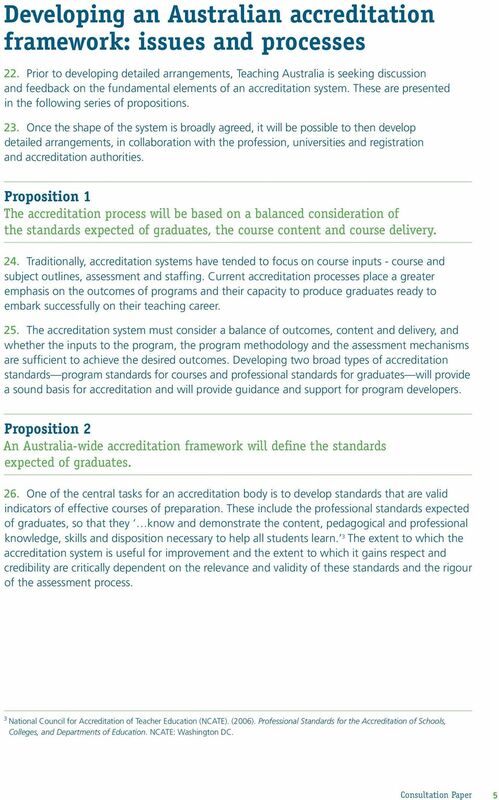 is proposing the development of levels of accreditation, based on criteria yet to be established, that indicate the extent to which a program meets the accreditation standards. Proposition 5 The national system will take account of the requirements of specific stages of schooling. 31. There is a basic issue as to whether accreditation should be generic, or based on specialised areas of teaching or stages of schooling (such as early childhood, primary, middle years, secondary). Specialised accreditation will provide an opportunity for assuring the public and the profession that teachers have achieved the required knowledge and skills relevant to that stage of schooling (such as the development of literacy and numeracy in early childhood and primary). While this will add complexity to the development of professional standards for graduating teachers, sees public benefit in taking account of the requirements of specific stages of schooling. DIETETIC CREDENTIALING COUNCIL TERMS OF REFERENCE. DAA member (APD) appointed by the Board from the membership of the council for a two year term.